Arriving in Phnom Penh from Ho Chi Minh City we were determined to avoid the premium (rip off!) pricing of either the official airport taxi or the hotel arranged airport transfer. So it was buy a local SIM (always my first priority) and contact Grab (my go to site for taxis in Asia). No luck – no drivers available! I had read that there were problems with the introduction of both Grab and Uber in Cambodia and we were experiencing it. So I tried Uber and soon had contact with a driver. As we left the airport building and mentioned Grab we were forcefully informed by some official looking guy that “no Grab. No Uber here”. A message came through from the driver that the meeting point would be the domestic departures parking area. Great, but where is the domestic departures parking area? The signs were prominent but in khmer font so useless when you’ve just arrived. So the search started. First to the domestic area. Then looking around to where the parking might be. Another walk following cars into the most likely area. I was following the Uber car on the app and we eventually crossed paths. Success! A fare nearly 50% less than that quoted by the airport taxi company. Arriving at night is always an interesting experience. Places look very different from the day. After being told that it closed at 10:30 we arrived at the Royal Palace at 10:15. But as we got to the entrance gate it was closed! I suppose that if you're the king you can close it whenever you want to!! It was only going to reopen at 2pm. We wandered along the deserted promenade from in front of the Royal Palace down along the riverfront. We stood and watched a local Mekong ferry crossing. Ferry after ferry was loaded and unloaded with a cargo of people, cars, trucks, bicycles and tuk-tuks. Every few minutes one would leave or arrive and there was a never ending stream of coming and going. This part of Phnom Penh is very pleasant. Apart from sections of fresh fruit and iced drink vendors mixed up with postcard sellers and street urchins and the ubiquitous policeman it is quite deserted. It runs along the bank of the Tonle Sap River, but many think that it's alongside the Mekong. Set within the walls of what was a school, education was turned on its head here. Some 17,000 Khmer and foreign citizens were imprisoned, tortured and executed as the Khmer Rouge hierarchy turned upon and then devoured itself. It’s a sombre and emotional place. It affects people differently. 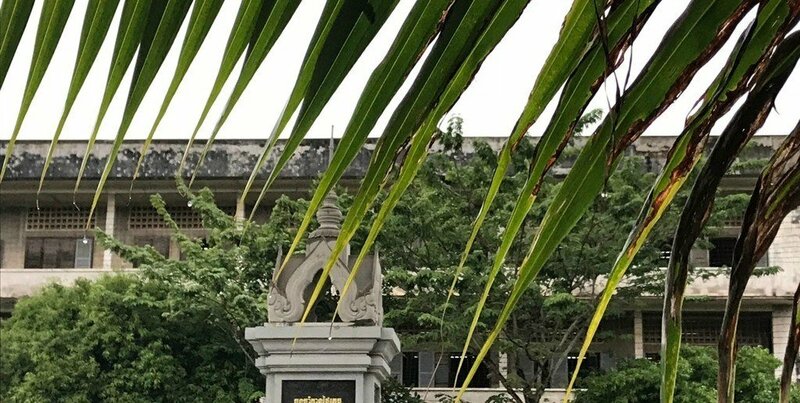 Any visitor, with any interest in the Khmer Rouge period, should begin their journey here. It has an excellent audio tour costing only USD3 which takes at least two hours to follow through. We were collected by Noun (our tuk tuk driver who we'd met the day before and was pleasant and very persistent) for our visit to the "Killing Fields". This was one of the main execution grounds for S21 and is located some distance out of Phnom Penh. This wasn’t the only location. "Killing fields" were located all over the country -- many if not most Cambodian towns will have an equivalent version of the one here. There’s a stupa loaded with over 5,000 human skulls. You can see the depressions in the ground where the mass graves were. From where these bones and skulls were exhumed. As with Tuol Sleng, this site affects people differently. It’s emotional and it’s definitely worth a visit (to listen to the full audio tour allow about 2 hours). The audio tour is well done and brings to life this monstrous event perpetrated by university educated people. Many visit in the morning, but the afternoons are generally a bit quieter. We've found that having a guide often doesn't add to the sightseeing experience. You are bombarded with names you can't pronounce and dates you can't remember. So we didn't take a guide. It's far better preparing your own guide beforehand as you then have some frame of reference. You can go back and revisit your notes with pictures and memories. The king is revered but is a figurehead. "A rubber stamp" was how he was described to me by one local. Get there early. It closes in the morning at 10:30 ... but maybe earlier!. The Royal Palace compound houses the Silver Pagoda, also known as Wat Preah Keo or Temple of the Emerald Buddha. It is so named for its floor, which is covered with five tons of silver. You can see some of the rather tarnished looking 5000 tiles near the entrance, but most are covered to protect them. The staircase leading to the Silver Pagoda is Italian marble. Rivalling the silver floor is the Emerald Buddha, an extraordinary crystal sculpture sitting on a gilded pedestal. Adding to the mix is a life-sized solid-gold Buddha adorned with 2086 diamonds, the largest weighing 25 carats. Created in the palace workshops during 1906 and 1907, the gold Buddha weighs 90kg. Directly in front of it is a miniature silver-and-gold stupa containing a relic of Buddha brought from Sri Lanka. To the left is an 80kg bronze Buddha, and to the right a silver Buddha. On the far right, figurines of solid gold tell the story of the Buddha. In 1892 during the rule of King Norodom the pagoda was originally constructed of wood. Apparently inspired by Bangkok’s Wat Phra Kaew, and was rebuilt in 1962. It was preserved by the Khmer Rouge to demonstrate to the outside world its concern for the conservation of Cambodia’s cultural riches. Although more than half of the pagoda’s contents were lost, stolen or destroyed following the Vietnamese invasion. What remains is spectacular. This is one of the few places in Cambodia where jewelled objects embodying some of the brilliance and richness of Khmer civilisation can still be seen. Examples of Khmer artisanship are along the walls of the pagoda. There are intricate masks used in classical dance and dozens of gold Buddhas. The many gifts given to Cambodia’s monarchs by foreign heads of state appear rather spiritless when displayed next to such diverse and exuberant Khmer art. Like in many pagodas and temples photography is not permitted inside the Silver Pagoda. It as was our final morning in Phnom Penh we wandered the streets. Most towns and cities in Asia do not cater for pedestrians. In many cases the pavements are non-existent and where they do exist they are used for motor cycle parking, business storage areas or seating areas for street food vendors. They are also uneven and in disrepair with odd unexpected steps or slopes. It’s still the best way to really savour day to day life – the sights, sounds and smells.